We want to thank you for supporting The Malcolm Jenkins Foundation! Your generous donation will be put to good use to fund youth development initiatives and programs that emphasize mentorship, character development, leadership, education, life skills, health, and recreation. The Malcolm Jenkins Foundation uses these programs to promote positive change in the lives of youths in underserved communities. Please help us congratulate our winner, Mike! 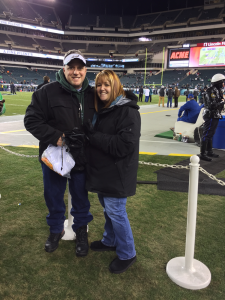 He and his family have been huge Eagles fans for over 40 years. He is so excited to be supporting The Malcolm Jenkins Foundation and the work that we are doing in the Philadelphia area.